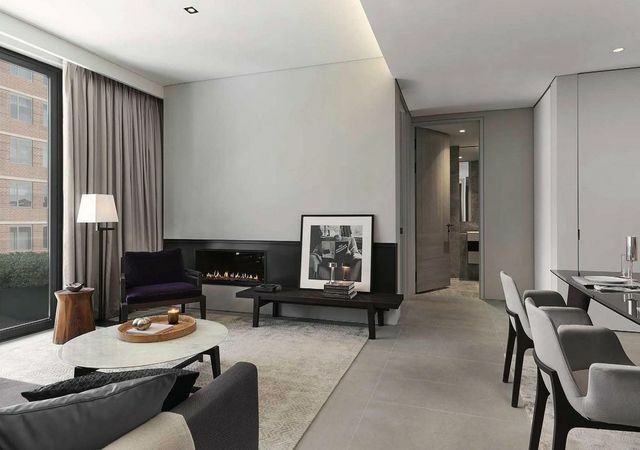 This 1, 255 SF two bedroom, two bathroom residence is designed with the distinction of a privately commissioned home, offering generous proportions and abundant light throughout. This 1,255 SF two-bedroom, two-bathroom residence is designed with the distinction of a privately commissioned home, offering generous proportions and abundant light throughout. Upon arrival through an Augsburg oak paneled private elevator landing, you are welcomed into a gracious den prior to entering the Poliform-Varenna chef's kitchen. The custom kitchen features Augsburg oak and high gloss lacquer cabinetry with under cabinet LED lighting, Caesarstone Pietra Grey waterfall edge countertops, and backsplash, and an integrated Miele and Subzero appliance package including steam and speed ovens, multiple warming drawers, and Poliform-Varenna vented hood. 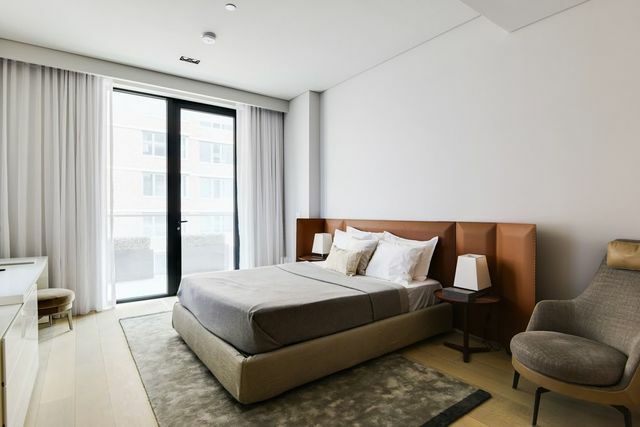 The corner master bedroom suite is a true sanctuary with a private terrace, southern exposures, and a spacious closet with integrated lighting by Poliform. The en-suite master bathroom features 7 wide-plank Bavarian Spessart oak and radiant heated Perlado Beige marble flooring, Perlado Beige marble and Augsburg oak paneled walls, custom vanity with integrated lighting, Perlado Beige marble shower tub with Dornbracht fixtures, and Toto Neorest water closet. This elegant and modern residence is further enhanced by honed Azul Grey limestone radiant heat flooring in all living areas, 7 wide-plank Bavarian Spessart oak flooring in bedrooms, flush base, door, and window surrounds, and floating walls and ceilings throughout. 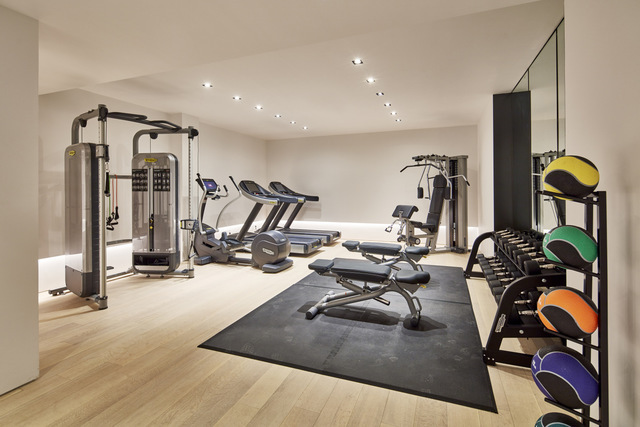 The five-star, hotel-like amenities are thoroughly curated and will include indulgent services and incomparable wellness benefits exclusively designed for Soori High Line residents in collaboration with Fitlore, New Yorks leading private wellness concierge. 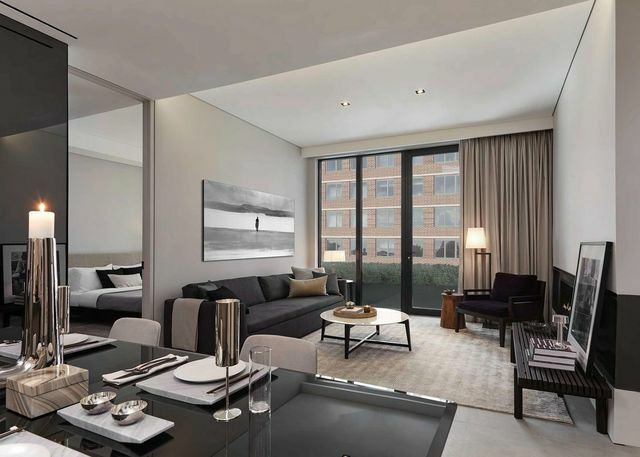 Additional amenities include a 24-hour doorman, concierge, state-of-the-art gym and spa suite with on-demand services, dedicated yoga and pilates studio, residence lounge, storage facilities, and private parking spaces available for purchase. The Distinction of a Privately Commissioned Home. Where West Chelsea Meets Hudson Yards. Your Sanctuary. Your Soori High Line. Sponsor: W29 Highline Owners LLC, 520 West 27th Street, Suite 302, New York, NY 10001. All dimensions and square footage are approximate and subject to normal construction variances and tolerances. Square footage exceeds the usable floor area. Computer renderings reflect the planned scale and spirit of the building. Sponsor reserves the right to make changes in accordance with the terms of the offering plan. The complete offering terms are in an offering plan available from Sponsor. File No. CD 13-0302 This 1,255 SF two-bedroom, two-bathroom residence is designed with the distinction of a privately commissioned home, offering generous proportions and abundant light throughout. 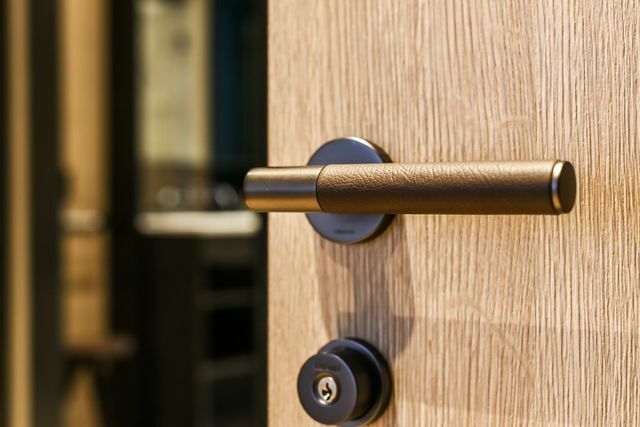 Upon arrival through an Augsburg oak paneled private elevator landing, you are welcomed into a gracious den prior to entering the Poliform-Varenna chef's kitchen. The custom kitchen features Augsburg oak and high gloss lacquer cabinetry with under cabinet LED lighting, Caesarstone Pietra Grey waterfall edge countertops, and backsplash, and an integrated Miele and Subzero appliance package including steam and speed ovens, multiple warming drawers, and Poliform-Varenna vented hood. The master bedroom suite is a true sanctuary with a private terrace, southern exposures, and a spacious closet with integrated lighting by Poliform. The en-suite master bathroom features 7 wide-plank Bavarian Spessart oak and radiant heated Perlado Beige marble flooring, Perlado Beige marble and Augsburg oak paneled walls, custom vanity with integrated lighting, Perlado Beige marble shower tub with Dornbracht fixtures, and Toto Neorest water closet. 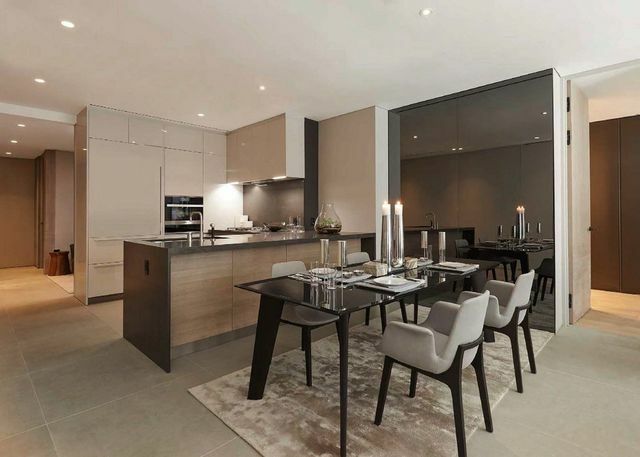 This elegant and modern residence is further enhanced by honed Azul Grey limestone radiant heat flooring in all living areas, 7 wide-plank Bavarian Spessart oak flooring in bedrooms, flush base, door, and window surrounds, and floating walls and ceilings throughout. 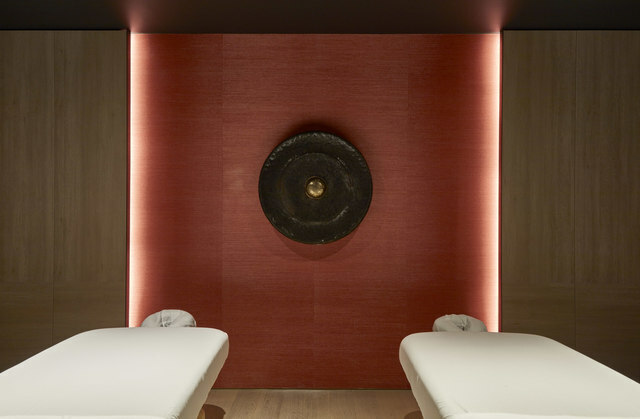 The five-star, hotel-like amenities are thoroughly curated and will include indulgent services and incomparable wellness benefits exclusively designed for Soori High Line residents. 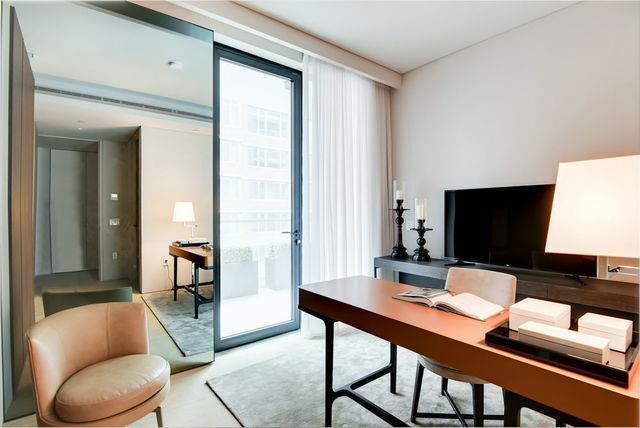 Additional amenities include a 24-hour doorman, concierge, state-of-the-art gym and spa suite with on-demand services, dedicated yoga and pilates studio, residence lounge, storage facilities, and private parking spaces available for purchase.